Everyone agrees that it’s a bad idea to move bomblets and other dangerous items. But, when there is no one to provide a safe alternative, what’s a farmer to do? Today is the coldest, windiest day yet. The guys are all bundled up in their warmest gear; some wearing ski masks. I’ve got to investigate why two or three of the fellows are working in just shirtsleeves. If they owned warmer clothing they’d be wearing it. If, as I suspect, they lack warmer garments I’ll share my wardrobe, but I doubt what I have will be a comfortable fit. As the team worked in the forest clearing a parcel that a Lao farmer hopes to turn into a coffee garden I tried, for the sake of warmth, to keep myself in motion. Adjacent to their work area was an expansive field that was slashed, burnt and put under cultivation at least three or four years ago. That zone was more windswept than the forest, but as the morning mist lifted, the sun both brightened my spirits and warmed my body. By my third lap around the perimeter of the two-acre site I was comfortably warm and looking for a purpose that would justify my deserting the thirteen men still working in the cold, shaded forest. I decided to keep myself in motion playing a solitary game I call “Where Would I Put The Bombie”. 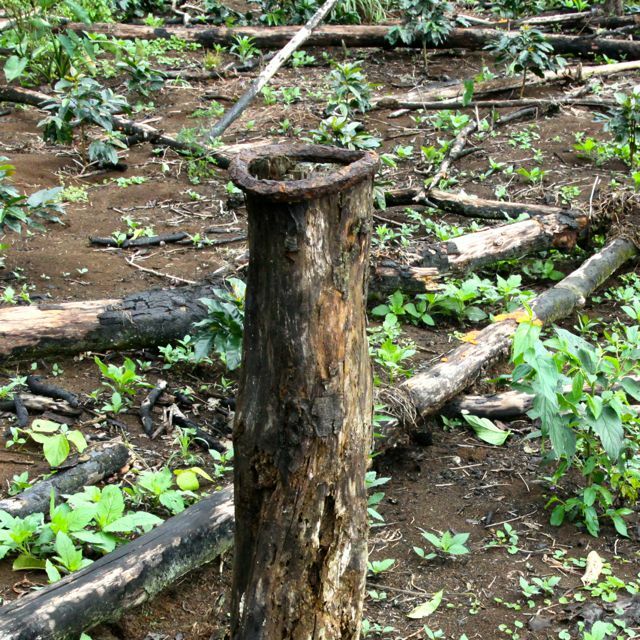 Farmers reckon that ordnance placed on tree stumps, ant hills or termite mounds are safer than items left where people might step. 50% of all accidents with UXO occur when someone is intentionally handling ordnance. In these parts it’s nearly inevitable that the land being readied for cultivation will harbor unexploded ordnance—relics of aerial assault: bombs, cluster munitions, rockets and other projectiles. If the area was the site of ground action there could be bullets, artillery shells, hand grenades, mortar rounds and the like. Some of these explosive remnants of war will explode in the intense heat of the fire lit to consume the cut and dried vegetation. Items on the surface that survive the fire will, after decades hidden from site in the underbrush, finally be exposed. And, when the farmer and his family begin to work the soil in preparation for planting, they may well discover objects that have been hidden from sight for forty years or more. The stuff that the farmer finds after the burn is his to deal with and most Lao farmers will deal with it wisely. If it can remain where it was discovered the farmer might roll a log over it, or bury it beneath a pyramid of rock. There it will sit for years while the family works the site. 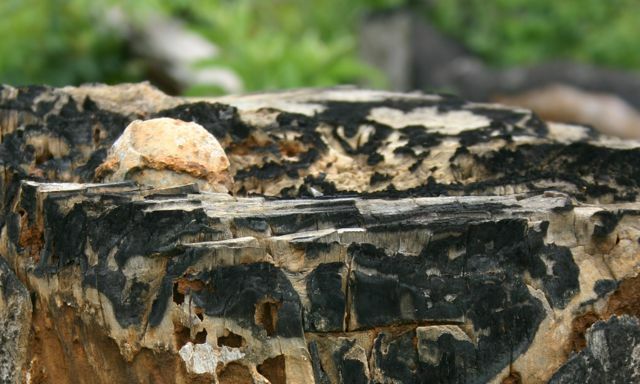 When the thin tropical soil plays out and the family moves on to slash and burn a new area the ordnance will be left behind, destined to live out its hundred-year life-span hidden beneath logs or rocks. But often, a farmer who finds ordnance inconveniently underfoot will choose to lift the item and gently place it where no family member is likely to step. 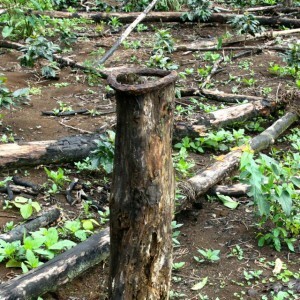 Farmers drop bomblets down hollow trees; they set them atop tree stumps, anthills and termite mounds. My game, “Where Would I Put The Bombie” requires that I walk an entire site and inspect every tree stump, hollow tree, anthill and other tempting depositories for relocated ordnance. Today, in an hour’s time I found two tree stumps that each held parts of once dangerous ordnance. In both cases, the items that the farmer discovered and feared were in a condition that left them incapable of further harm, but the farmers didn’t know that and were wary enough of their family’s safety that risking injury by moving the objects was judged to be better than leaving them where found. A final, sobering statistic: In Laos, of the many thousands of accidents with UXO that have occurred since the war ended forty years ago, nearly half involved someone intentionally handling the device. Those unlucky farmers, who tried but didn’t make it to the nearest tree stump died trying to keep their loved ones safe.